Los Chorros is a popular spot for picnicking. John Pint snaps a photo of a gravity-defying rock formation in the Magic Rocks area, between highway 70 and the Chorros de Tala. One of several impressive amate trees (strangler figs). Renovated cabin at Los Chorros. 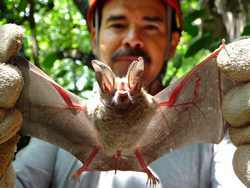 Leonel Ayala with a bat residing at Los Chorros de Tala. This natural stone cylinder is an excellent example of the Fossil Fumaroles composed of Tala Tuff. This one is near the cabins. A young hiker from Guadalajara stops to rest in a “natural armchair” among the Magic Rocks near Los Chorros de Tala. Los Chorros are the only “serious” waterfalls along the entire length of the river known both as Rio Caliente (Hot River) and—after it cools down—Rio Salado (Salty River). They are located 23 kilometers west of Guadalajara and reachable via highway 70, the route to Tala and Ameca. 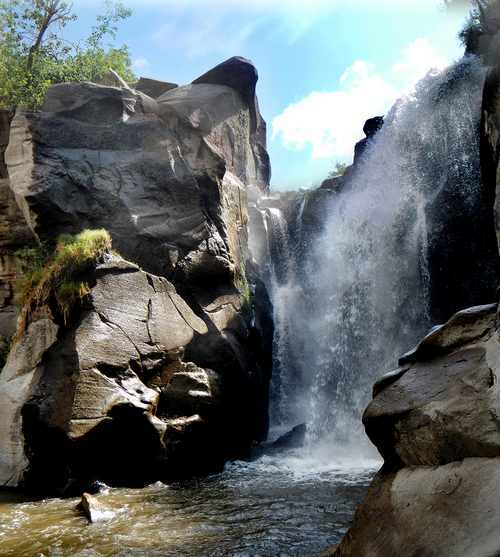 These beautiful falls are described in the 2011 edition of Outdoors in Western Mexico, Volume 1. Figuring it was time for an update, I visited the place recently to see what’s new. The first thing I should mention is that there is now a concrete divider running down the center of most of highway 70, meaning that people coming from Guadalajara can no longer make a simple left turn to get to Los Chorros. No, you now have to drive an extra three kilometers to the first place you can make a U-turn and then another three kilometers back to the Chorros Road. “The fact that people can’t make that left turn has killed our business,” I was told by Hector Cuevas, one of the owners of Los Chorros. And, as a result, he told me that the main emphasis of Los Chorros has shifted from picnickers and bathers to wedding parties, where the bride and groom can tie the knot outdoors with the majestic falls providing the perfect backdrop for envy-of-the-barrio wedding photos. In my book, all of this is good news. It means there is now far less noise and there are far fewer people at Los Chorros on a weekend. So, on the work day of your choice, you’re practically guaranteed to have the entire place to yourself. 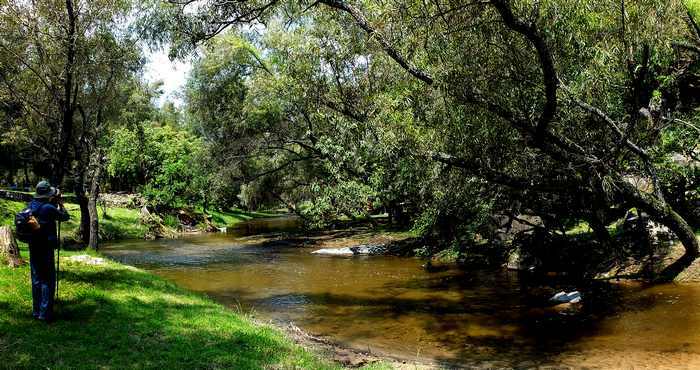 Peaceful and Picturesque, el Río Salado makes its way from Los Chorros to Presa la Vega where it emerges as the Río Ameca, which flows all the way to Puerto Vallarta. Another plus is that all the cabins are being renovated. We took a look at one where an ample Jacuzzi is being installed, from which you’ll be able to watch a giant plasma TV while enjoying your hot, bubbly bath. The cabins are set back in a charming wooded area, well away from the picnickers. They now cost 1200 pesos per night and are designed for four people. To my surprise, I discovered there are some extraordinary rock formations close to these cabins. The Tala area is famous for its Fossil Fumaroles, which stick up out of the ground like small tree stumps… so small that we used to call them Fairy Footstools. However, these Stone Stumps at Los Chorros are each over a meter tall, just about the right height to serve as a stone-age lectern for an outdoor talk on the geology of the Primavera Forest. There are two trails by which you can get up to the top of the waterfalls, which, I think, are even more spectacular when viewed from above than from the bottom. However, I was told that the paths leading up there are so overgrown with vegetation during the rainy season that you need a machete to get through. Fortunately, thanks to Jim Boles and his hardy lakeside hikers, I learned about another route leading to the head of these falls, which lie in a most interesting area called El Tempisque. Stand by for an article on this site, coming soon. Back to Los Chorros: “Swimming” at the base of these waterfalls has been reduced to splashing in the shallow river, as people are no longer allowed near the base of the falls, where more than one unlucky visitor has drowned in the past, trapped in a kind of whirlpool which forms there. This means that water sports at this site are pretty much limited to splashing in very shallow water. Just the thing for toddlers, I guess. If you visit Los Chorros, I strongly suggest you stop to see the “Magic Rocks” located just northwest of the dirt road that takes you to the falls. Drive about 700 meters from the highway and park your car, for example at N20.69081 W103.68808. Then walk 250 meters up the hillside, and spend some time wandering among these wonderfully bizarre formations of the Toba Tala (Tala Tuff). They cover a narrow strip about 800 meters long, parallel to the dirt road leading to the waterfalls. It's a great way to work up an appetite before having a picnic at Los Chorros. From the Guadalajara Periférico, take highway 15 (Nogales and Tepic) 25 kilometers to highway 70. Now drive west towards Ameca and Tala. Just after the road curves southward watch for the Chorros sign on your left (14 kilometers from the Nogales Road). Unfortunately, you can't turn left here, so continue another three kilometers and make a U-turn. Go back to the Chorros turn (N20.68766 W103.69299). Now go northeast 718 meters to the Magic Rocks parking spot (N20.69081 W103.68808) or continue another kilometer and a half to the Chorros parking area (N20.69538 W103.67885). Yes, you have to drive across the Río Salado to park, but don't worry: you are actually crossing a kind of concrete bridge and the water is very shallow. Any car can do it and you get a tire wash for free! The driving time from Guadalajara is about half an hour.